It’s virtually impossible to write anything over a hundred words without making an error. When you need to be perfect, WhiteSmoke Writing Assistant will be your proofreader. 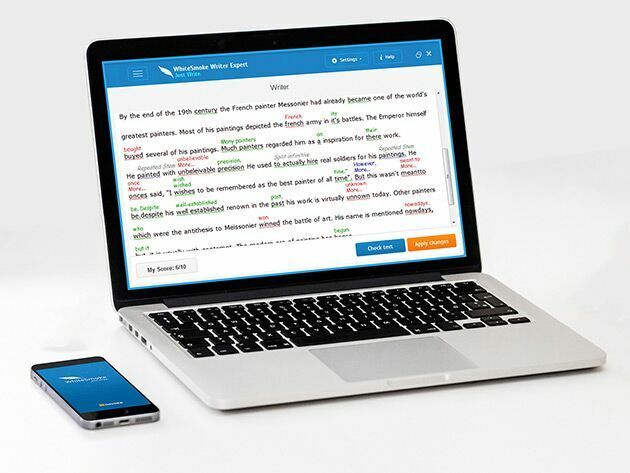 This intelligent app uses advanced algorithms to highlight faults in your spelling, grammar, punctuation, and style. Right now, you can get lifetime Premium access for $79 at MakeUseOf Deals. Potential employers and clients don’t care about human error. They want to see carefully crafted, error-free prose. Even a single spelling mistake can be enough to sow the seeds of doubt. WhiteSmoke helps you live up to these high standards by flagging every flaw in your writing. To find the faults, WhiteSmoke uses intelligent algorithms to understand the meaning of your words. The app then finds every typo, grammatical error and misplaced comma in your draft. WhiteSmoke can also translate between different languages and check your work for plagiarism against a huge database — a very useful tool for students. WhiteSmoke works in any web browser, and you can also download the desktop apps on Windows and Mac. The apps work seamlessly with Word and Outlook, meaning you can write error-free reports and emails without changing your workflow. You can get a WhiteSmoke Premium subscription now for $79, saving 80% on the standard price. It makes a great gift for students and anyone else who needs to write perfectly. Want your products featured by MakeUseOf Deals? Learn more about how to sell your products online! I have taken the offer and started using the software, and I wish I didn't. This software keeps communicating with suspicious sites and my ESET Internet Security software keeps warning me about this communication. I added the software to the exception list in ESET firewall and unfortunately more other unknown communications started in the background, according to ESET logs. When I did research through the Internet, discovered that although the software is legitimate, the WhiteSmoke web site acknowledges they make their technology available through other channels, such as a browser-based text editor, and specialized OEM versions designed for integration with third party service providers. Malwarebytes' Anti-Malware added PUP.WhiteSmoke to its detection database in November 2010. I uninstalled this software, I pray it didn't leave something harmful in my PC, and I feel sorry for the money I lost in this deal. I wish MakeUseOf site would do a better research about the offers they publish in their site.